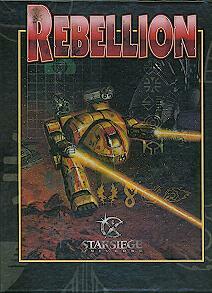 This game was developed in parallel with the Starsiege computer game (Dynamix), sequel to Earthsiege. Three sides - Empire, Rebel, and Cybrid (AI) - fight for control of the solar system, with the rules allowing for combat between units from squads to divisions. All forces use Hercs (bipedal combat vehicles) as well as hover and tracked vehicles, with aircraft and artillery in support; but each force has unique vehicles and weapons. Designed for fast play and large battles. Players choose their forces from one of three vehicle lists, and can customize the weapon and equipment load on each machine. Each side has its own rules of organization (and different nomenclature), but in general, individual units are grouped into squads of around four vehicles (often of the same type), with a common experience level (green, regular, veteran, elite, or legendary), led by a squadron commander. Squads form companies, companies form battalions, and battalions form divisions, each of which is led by a field commander. Larger forces qualify for recon or support assets. At the beginning of each turn, players place hidden markers to determine which order their squads (usually 4 vehicles) will activate in, and to assign roles to air and artillery assets. Initiative is rolled to determine who moves first. Players then alternate activating squads. When a squad is activated, it is given an Action: Fast Advance, Advance, Cautious Advance, Cover Fire, or Rout. Combat may be initiated at any point - before, during, or after movement (if any). A vehicle may fire at anything in its arc of fire, except that rules limit the ability to single out individual members of enemy squads, and fire is mandatory against enemies at close range. Direct fire weapons require a line of sight. 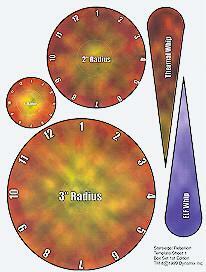 Certain weapons affect all units within a particular radius of their immediate target. 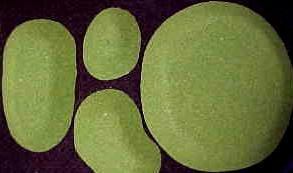 A "to hit" roll determine the success of the attack, with certain weapons making multiple rolls due to high rates of fire. Modifiers apply due to range and terrain. For most weapons, experience allows a bonus die to be rolled (type of die determined by level of experience). Ammunition is tracked only for missiles and mines. Rules also cover off-board and on-board artillery, and counter-battery fire. Certain units may be cloaked, making them harder to target. 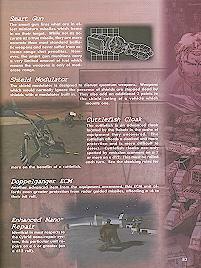 Vehicles are defended by shields and armor, with armor usually coming in to play after shields have been brought down. 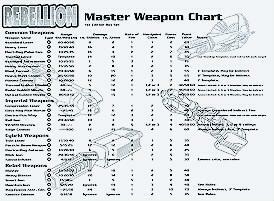 Weapons are generally effective against either shields or armor, but seldom both. 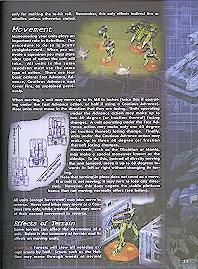 Hits which penetrate armor cause a loss of damage levels, which eventually will put the unit out of commission. Significant damage by a single shot also causes Critical Damage, which can knock out various systems, or even eliminate a unit by killing its pilot. 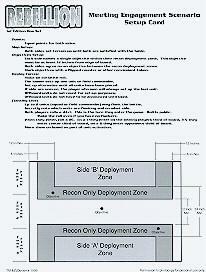 Squad members must maintain unit coherency by remaining within command radius of their squadron commander (radius varies by commander's level). Field commanders operate as individuals (but can activate with another squadron if desired), can spot for artillery missions, and can make limited changes in the activation order. A Morale Check is required if a squad loses too many vehicles, or if a friendly unit routs through a squad. 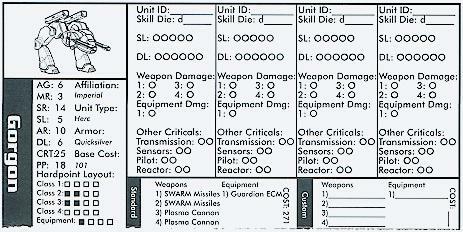 A single commander may apply his modifier to this roll. As a consequence of one or more morale failures, a unit may freeze, retreat to cover and become pinned, or rout (flee). Rally Checks are made to restore units to good morale. Optional rules add complexity to the game - adding uncertainty to the activation order, allowing a unit to "paint" a target to improve missiles and indirect accuracy, adding types of armor, allowing slow units to gain accuracy while also becoming an easier target, and including on-board indirect (non-artillery) fire. Each side has unique opportunities. 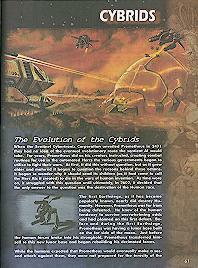 The Cybrids suffer extreme penalties when an Alpha (commander) is lost. The Rebels have improvised combat vehicles (former mining equipment), but are equipped with advanced technology of alien origin. Each side has five or six unique weapon types, and at least three unique equipment items. For instance, both Cybrids and Rebels have access to different versions of nanite technology; but only the Empire has pulse mortars and siege cannons. Rules are included for a "meeting engagement" type scenario. The publisher plans to bring out supplements for the game system, including future rules for adding infantry to the game. 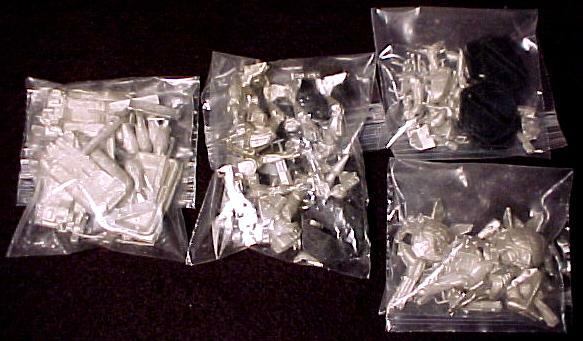 The game comes with sufficient miniatures to create an Imperial company (weak) and most of a Cybrid Quadron (missing one quad). 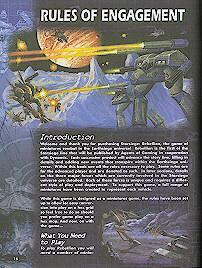 Also included is a short piece of fiction, and a history of the Starsiege universe. The year 2829 A.D. in the Earthsiege/Starsiege universe. Seeing civil war break out between the Empire (Earth) and the Colonial Rebels (Mars, Venus), the hostile Artificial Intelligence known as Prometheus launches its third attempt to eradicate Mankind. Each figure appears to represent a single combatant. 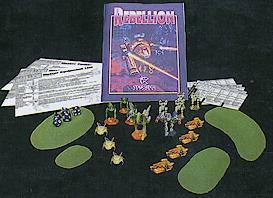 Intended for use with the Starsiege line of miniatures (10mm scale). This supplement has been announced for release in February '99, and will be in book form. Nothing else is known at this time. Background flavor very interesting and in about the right portions, 15 pages out of 90. If you are a fan of the computer game this is probably old news, but to a newbie like myself it did a good job of setting the table. Rules seem to be pretty clear and clean. Artillery looks to be the wild card in the combat mix - your field commander or spotter calls it in, then you have the choice of when to bring it down. If you are targetting a unit that has already done its action you can wait, but if you do you are subject to counterbattery fire which can run the risk of losing your artillery unit. Add to this a "reposition" command which can be given to your arty unit which then wastes the counterbattery fire, and you can get into some serious mind games with your opponent. Leadership values are all important. The more experienced your leaders, the more likely they will hit their targets, do more damage, recover morale, etc. The real kicker I see is in their ability to reorder activation commands. Each squad is given a marker indicating in what order they will be activated. 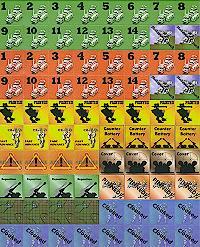 Your field commander can use his turn to reorder this sequence based on what your opponent has done. The more experienced the commander, the more markers he can shift around. Where I see this being real fun is when you are playing with multiple players on a side with a commander. "Sorry Tom, I know you want to waste that bad guy at point-blank range who will blast you to slag if you don't shoot first, but if I shift you from first to last our team will be in a much better position." The minis are a nice blend of Battletech-ish, WH40K Eldar-ish, Ogre-ish tanks, hovercraft and hercs (mechs) They do suffer from a major drawback (see Bad Things, below). Other production values are great, colored markers, templates, etc. 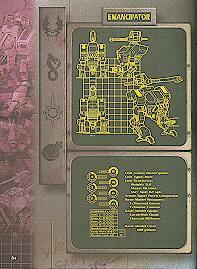 and a well-organized rulebook a beginning player can easily grasp. While the basic rules are easy to grasp, there is a lack of other warm-fuzzies, which a brand-new wargamer might find unsettling. More examples of play would have been appreciated at certain points. The organizational material for the three major powers is woefully sketchy - e.g., a squad consists of 4 vehicles but not necessarily armed in the same way. A few examples here would have been helpful. Scenarios are non-existent despite the presence of one page entitled Meeting Engagement Scenario. I quote: "Points: Equal points for both side" Duh! Nothing in this scenario ties into the background material, or even gives an idea of what units to take. I haven't done the math yet but I assume the minis which come in the box are equal in size? [Actually, no - Editor] A few scenarios based on the background would have been much appreciated, especially when learning the rules. Too many references to what I can only assume to be future releases. Infantry rules to be released later, Imperial Knights do not have the same organization as other imperial units, but it doesn't say what that TOE is, etc. The minis are my main gripe. The hovercraft went together with a minimal of fuss, as did the larger of the hercs. The Talons and the Seekers both suffer from what I have called The Republicans Disorder - they lean way too far to the right. The Talons come with a slottabase and you have to bend them like crazy to stand upright. The Seekers don't have the slot, so you glue them directly to the base. The first one I did I thought I misaligned the legs, it leaned so much. After assembling the other three, the only conclusion is that the right leg is too short. The only one that stands semi-erect is one with only one foot on the ground (a pose which is not good for transporting minis around). The Seeker is a nightmare to assemble. Eight (!) individual pieces to assemble a mini approx. 35mm high. The wings are about the size of a quarter-inch photo-etched detail part in a fancy model, which has to be glued into a tiny slot. Even with tweezers, superglue and superglue accelerator I was cussing the artist who designed these. 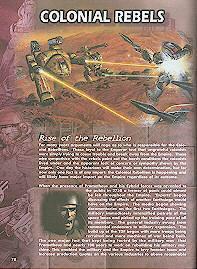 On a scale of 1 to 10, I give Starsiege: Rebellion a 7. I think the rules will appeal to those who are interested in the Sci-Fi mech type of games, but who don't want or can't figure out which MechWar books and rules to buy. At US$60 for the basic set, I hope any future expansions are in the US$20-25 range. If the Seeker model is indicative of the complexity of other models, I will be very disappointed. The rules seem fine and I will probably use minis from other companies - especially my Ogre minis - to make larger scenarios. Hmmm... how would a Ogre MkV fare against a Cybrid Executioner...? I like the game... plays fast and even my 11-year-old daughter is into it. We are playing right out of the box, and there are plenty of minitures for us to get started. We play lots of other miniature games - Clan Wars, B5 Wars, DBA, DBM. Are all giant robot miniature games the same? 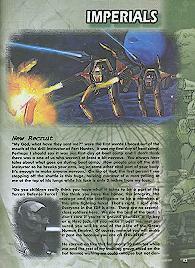 Seems like maybe Starsiege learned the lesson from their predecessors. By the way - miniatures are great... Cybrids are kind of hard to put together but look great once you get them glued up. I myself come from a long line of Mecha gaming (starting with BattleTech, going to Heavy Gear, now to reb... with lots of little games (Robotech/Macross, Rifts and others) thrown in somewhere or another) and really like the basic gaming system. I personally like to compaire the fact that 2 complete novices can finish 3 turns of Reb in the same time it takes 2 pros to finish 1 turn of BT, pressuming the BTech players have half the units of the Rebellion players. Includes background material, sample art, photos of miniatures, complete product listing. subscribe starsiege alone on a line in the body (or "subscribe starsiege-digest" for the digest version). Mail can be sent to everyone on the list by emailing starsiege@csua.berkeley.edu. 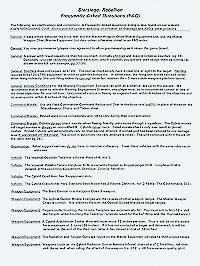 Latest news on future games in the Starsiege/Earthsiege universe. Central website for information on all of the Starsiege games, including pre-release photos and forum for the miniatures rules. By Camille "Godmom" Klein at badkarma. Official answers to a few of our questions. Provided by Marco Signore (signorem@netlab.it). In MS Word 6.0/95 format. If you know of other resources for this game, or if you have material you would like to make available to the Net, please let us know.